I shared last week on my Facebook and Instagram accounts an old blog post that was published on Women’s Running online. Well, it’s actually a funny story how that all happened. Last month, I went to my coach’s holiday party. I was super apprehensive about going because I don’t know many of her athletes and had only been running under her guidance for a few months. But, I wanted to show my appreciation for her by attending so I mustered up the courage to go….alone. Sure enough, I found myself standing all by myself, just kinda hanging around waiting for at least one of two people I knew would be there to arrive. A girl who I had met briefly on a run remembered me and seeing that I was alone, walked my way and made conversation. She introduced me to a few of her friends, others who have trained under Susan, my coach. One of them asked me what I did for a living to which I replied, “Well, nothing.” Talk about awkward! LOL! I mentioned that I used to teach English, and now get my writing/reading fix through blogging and then turned the conversation to her and asked what she did. She said she worked for Competitor Group. I knew the company once owned the Rock and Roll race series because I’m an ambassador so I asked her if the sale to Ironman affected her at all. She said that she worked for the Women’s Magazine division so not so much RnR. I immediately became self-conscious and said that my writing wasn’t any good and probably not what they were looking for. She was so sweet though and told me to think about it. We exchanged contact information and that was that. A couple of days later she contacted me and told me to just give it a shot. I decided, why not? So I sent her a few posts…I didn’t tell anyone about it, and didn’t tell anyone when the web editor approved them, and didn’t tell anyone when she told me the first one would be published late January. But when I got the e-mail that it went live, I still couldn’t believe it. There was my blog post for all the world to see. Not gonna lie, I was super nervous. I’ve been very comfortable in my own private, small corner of the internet blogging world. I’m not a “big” blogger nor did I start blogging to “get big.” I know that the more exposure my blog gets, the more criticism and not-so-nice opinions come with it. And that’s okay. I know that it’s tough to “get me” or understand the context of the article without having been a reader of my blog for a while. I know, or hope, you guys know, that I’m very grateful to be able to stay home with my kids while at the same time, struggling to let go of a career I studied for and worked at for a long time. And I’m choosing to use this time to put my energy into training and making things work for where my life is currently. AAAAHHHHHHHH!!!!!!!! 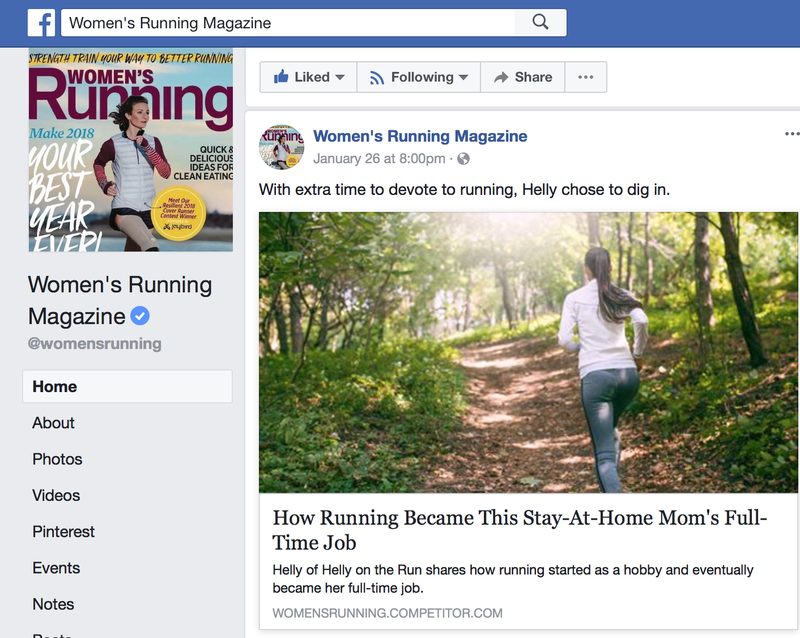 Helly, I thought it was soooooo cool that you were published in Women’s Running. I wondered how it had happened. Tis true that the more exposure you get, the more likely you’ll get neg comments, but them’s the breaks. Honestly, it doesn’t matter what you had written, there would have been something. 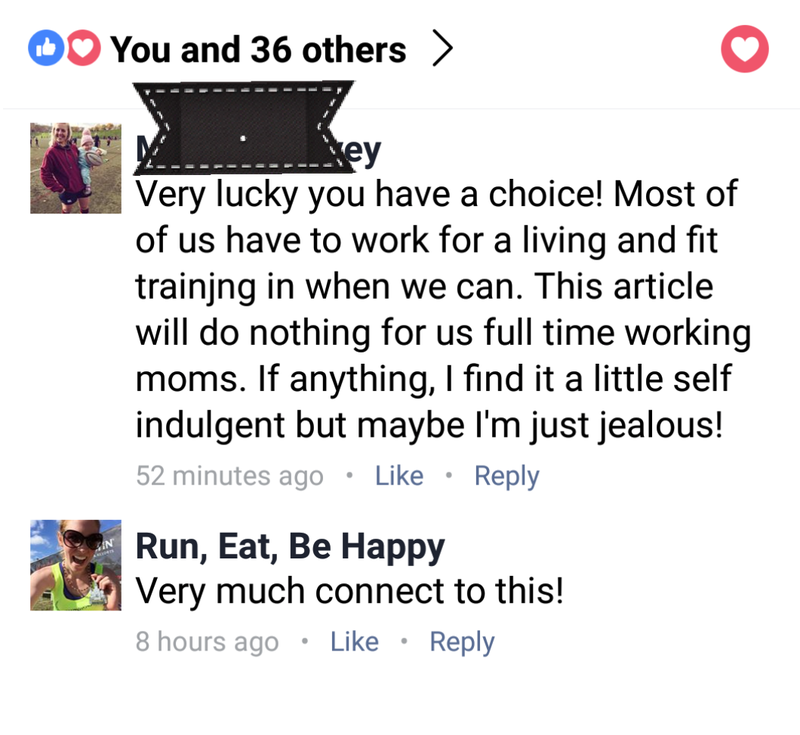 Let’s say that you worked 60 hours a week, have kids, and ran, then the negative comments would have been that you’re lucky that you have kids healthy enough that you don’t have your time sucked into going to hospitals and waiting, or how selfish you were for running when you barely have time to take care of your kids with the crazy work schedule that you have, or you’re on your way to burnout, blah, blah, blah. I always loved you because of your authenticity. You’re truthful and aware about your life. That’s what I like about everyone I follow. It doesn’t matter if they’re faster or slower than me. I want people who are thoughtful about whatever it is they’re doing. I agree sooo much! Authenticity is the most important to me! Helly is very humble and so sweet. Thank you Halley! You’re pretty amazing too! You’re so right. In the end, it didn’t/doesn’t matter what I write. Love the article and I’m so proud of you for sharing it with everyone. There is always going to be critics but you have to just be your own self. Don’t let the fear of what others may say or think hold you back. As a fellow SAHM I understand how hard it can be for us to really express all that we do even tho we don’t go to an actual “job”. With a husband who travels most of the time I really don’t have the option to work, even tho I would love to! I think it’s important to understand every mother works hard to be they beat they can be no matter their situation. Wow Helly!!! That’s so cool! Lol every time I read some poor-pitiful-me comment like that from someone about how lucky someone is to have whatever kind of time for running (or whatever) but the poor poor comment writer is just SOOOOOO BUSY, I have to laugh a little, because they are clearly not too busy to write snarky, self-righteous comments towards strangers on the internet. You do you! Very cool – you should be proud for sure! So excited for you. Thanks for sharing how you got that submitted. When I saw you post it, I was curious. I think you are pretty fabulous! Yes, totally random! I’m glad I ended up going to the party, lol! Very cool! There will always be haters, like Elle said. F*ck the haters girl! I have a full-time job but am allowed flexibility to run during lunch (when I can) and work from home from time to time (like today) and people give me a hard time…I like to think it’s just jealousy right?! Just keep doing you; we support you out here in bloggerland! 🙂 Congrats on being published; so stinking cool. That’s wonderful you got published!!!! That woman is just jealous!!! I wish more people lived by the old adage- if you can’t say anything nice, don’t say anything at all! If I was staying home, running would be a big thing for me too:) You’re giving your kids such an awesome example! ← Rock n Roll Arizona: Race and Half Marathon PR!!! !